The Kershaw Fillet Knife with 9-inch blade offers functional quality and a price appropriate to a knife which usually gets the worst treatment possible. A little maintenance keeps it in good shape. Manufactured by Petzl of Monaco, France, this colorful knife intends to meet the needs of alpine climbers. Light in weight and easily opened, the Petzl SPATHA will be most popular with people impressed by the name. 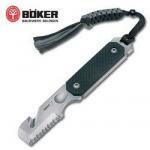 Gerber's Back Paxe offers backpackers a versatile camp tool small enough to carry conveniently into the deep woods. 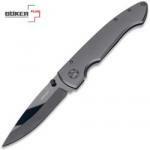 While it doesn't provide full-sized power, for some uses the Paxe outperforms a survival knife of equal weight. 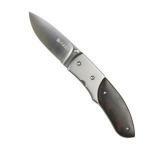 The 30-30 Folding Hunter from Columbia River Knife and Tool was designed by former Alaskan hunting guide Russ Kommer. The knife's build eliminates unsanitary gaps and shields important working parts from the mess that's an unavoidable part of field dressing game. Knife maker Kit Carson created his series of M16 Knives with custom-built machined titanium handles. 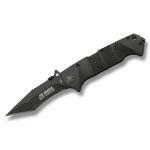 The Columbia River Knife and Tool M16-14T Big Dog Tanto now brings that superior quality to CRKT's production versions. Ceramic blades get better every year, and although owners still need to relearn a few basics of use, knives like the Boker Plus Anti-MC could make you happy simply because they're razor-sharp and stay that way.